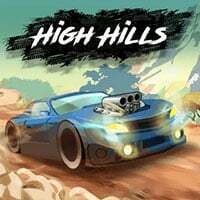 How far can you go in High Hills Game? Get in your car and try to master a track full of steep hills, tricky obstacles and dangerous spikes. The controls are simple: tap to drive and hold to spin your car backwards. Make a flip to earn a bonus and collect additional coins to upgrade your vehicle in the shop and drive even further. Make sure to pick up Jerry cans on the way before you run out of gas – in this case the game is over. Can you pass all obstacles and achieve a high score? You can play this game on all devices. So enjoy and have fun in playing High Hills Game. Good luck. Also make sure to check out Short Ride Game, you may enjoy playing it.